Want to learn how to draw sports cars? You’re in the right place! Now that you’ve got to grips with the Pen Tool and drawing freehand, we’re going to continue cleaning up our lineart so we end up with a great basis for our finished painting. 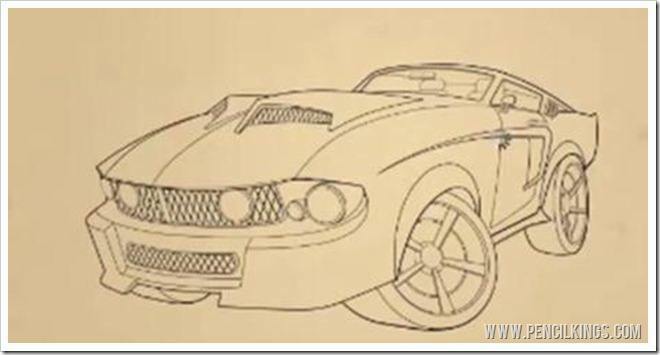 In this lesson on how to draw sports cars, you’ll pick up some awesome professional tips and learn how to draw complex detailed areas in the final stages of your drawing. So, if you’re ready, let’s head out on the highway and get cleaned up! The first part of this video on how to draw sports cars is filmed in time-lapse so you can quickly see our tutor April’s working method. Notice how she keeps zooming in and out and using a combination of the Pen Tool and freehand lines to clean up her lineart layer. When drawing lines, one of the main things to avoid is a tangent – where two lines meet awkwardly. Here, you can see how the line April has drawn meets with the outline of the rear-view mirror and clashes with it. The best way to fix tangents is to make one line more dominant than the other. In this case, April takes the line and moves it so it now sits behind the shape of the rear-view mirror. Sometimes, especially when working on perspective drawings, it’s impossible to avoid tangents completely. However, as a general rule, you should try and avoid them wherever you can. Once you’ve spotted and corrected one tangent, you may find you come up against similar problems in other parts of your drawing when learning how to draw sports cars. No problem! Here, you can see how April spots a tangent where the raised part of the hood (the header) meets the windshield. To correct this, she adjusts the curve of the line so it becomes more dominant. Notice how the header now sits in front of the windshield and pops out of the drawing? 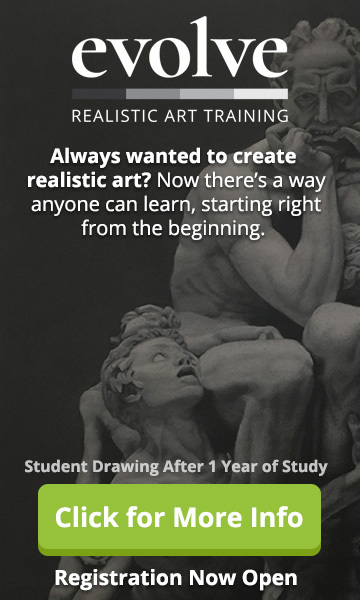 You can use this technique in other drawings to make certain elements really stand out. 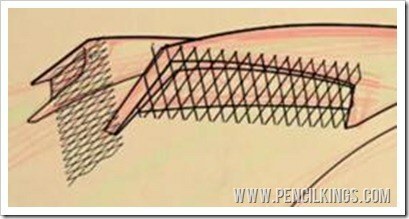 Not only is the header one of the prominent parts of our drawing, it also contains a detailed grill or mesh. To create this, draw a series of around 15 short vertical lines and then duplicate them on a new layer.Then, rotate your lines to create a criss-cross effect for the grill. Once you’ve created this shape, you can then duplicate it and transform it to fit in other areas. 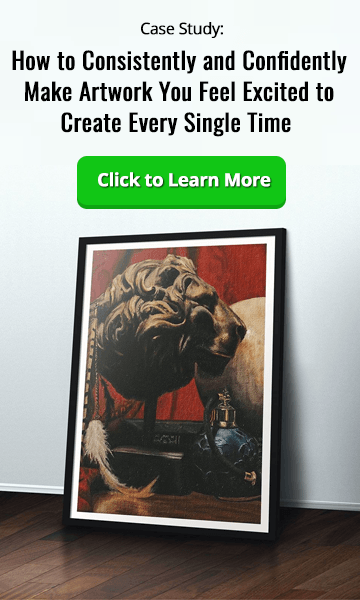 Use the Marquee Tool to select and erase any lines you don’t need. Once you’ve created this grill pattern, you can also use it to create the grill at the front of the Mustang – simply transform it and skew it to fit before placing it into position. To create the headlights on your Mustang, draw a circle, and then duplicate this by hitting V and holding down Alt to make a copy. You can then re-size the circle to create the inner and outer parts of the headlight. To create the other headlights, simply duplicate the one you’ve just drawn and transform it to suit. 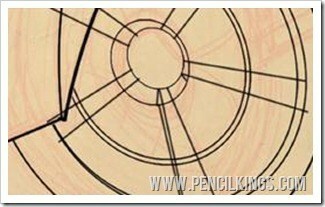 To create the wheels, use a similar process again – draw a circle, duplicate it and transform until it looks right. You’ll notice how the wheel is made up of many circles or ovals. To create the tire, duplicate the largest oval (the outside if the wheel rim) and place it alongside.Then, using the Pen Tool, create a curved line to join both these shapes together. Do the same at the top and you should end up with a 3D tire that really completes your drawing. 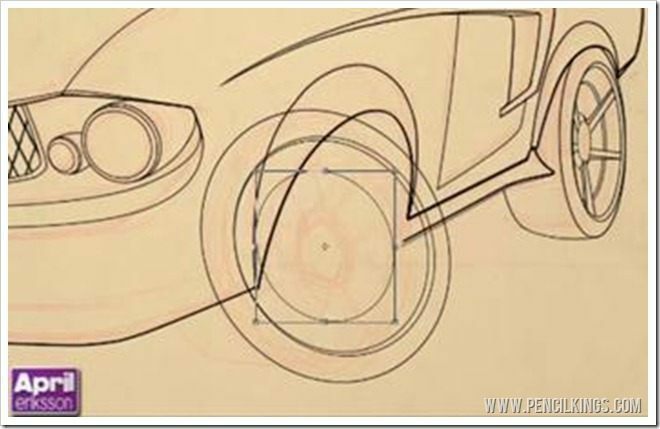 Repeat this process for the other wheel and look at your reference pictures if you’re unsure.To create the spokes inside the wheel, draw and duplicate a series of diagonal lines and make them look 3D by drawing the sides too. 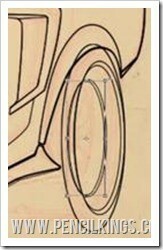 Once you’ve finished the front wheel, you can duplicate this for the other side and erase any lines you don’t need. Don’t forget to use thicker lines for outlines, medium lines for other elements and thinner ones for cutlines. Eventually, you should end up with a clean layer of lineart which will form the basis for the rest of your digital painting. In the next lesson on how to draw sports cars, you’ll be learning how to add color to your drawing and turning this into a fully-rendered digital painting of a 1967 Mustang! 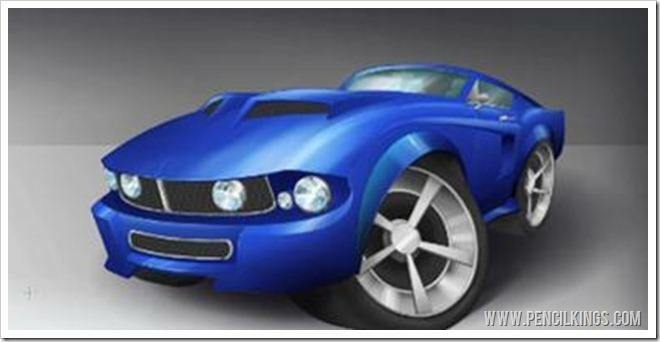 We hope you’ve learned a lot through watching the videos in this series how to draw sports cars. 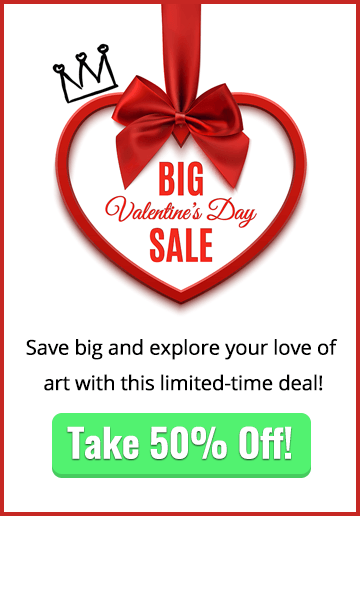 Remember, you can apply these same professional techniques to any subject matter and create awesome art for your portfolio. Have fun and don’t forget to leave a comment below to let us know how you’re getting on!